Inspiring Art Teachers to Explore Art History | Curator’s Corner: You Think You Know Ancient Egypt? At first glance this small sculpture would lead the viewer to believe that it was firmly within the realm of ancient Egyptian art. It actually belongs to a culture that bordered dynastic Egypt, and twice established dynasties that ruled Egypt. Much like the Roman Empire, ancient Egyptian culture had a strong influence on surrounding (often conquered) cultures. I find the purity of the traditional Egyptian funerary style remarkable in this piece that commemorates a Nubian (Kushite) ruler. Senkamaniksken ruled over his homeland of Kush only a couple of decades after the Kushites had ruled Egypt, establishing Dynasty 25 (712–657 bce). The Kushite kingdom extended from south of Aswan on the Nile into northern Sudan, where the capital Napata was located. Interestingly, the Kushites of this period were the first to revive pyramid building since the Middle Kingdom in Egypt (1986–1759 bce). The remarkable thing about the Kushites is how thoroughly they adapted Egyptian religious and artistic conventions. The Kushites ruled Egypt twice, in the Second Intermediate period (ca. 1696–1539 bce) and the 25th dynasty, which fell to Assyrian invasion. They retreated to their homeland south of Upper Egypt, and established a kingdom that flourished for almost 1000 years. The ushabti (this is one of nearly 1300 found in Sekamaniksken’s tomb) was yet another device to ensure that the deceased made a smooth transition into the afterlife, which Egyptians (and subsequently Kushites) believed would be a mirror of the physical world. 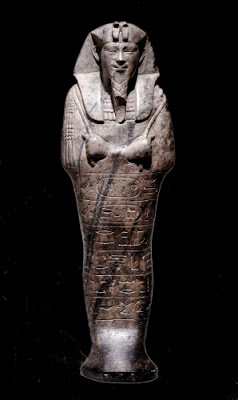 The ushabti were meant to be receptacles for the deceased’s spirit (ka) should the body be damaged in any way. The Kushites have totally adapted Egyptian iconography, including the crook and fly whisk (symbols of kingly power), as well as the uraeus on the forehead (cobra and vulture). The uraeus is a conceit on the part of Senkamaniksken, because it symbolized rule over Upper and Lower Egypt. Studio activity: Found object ushabti, a hometown sculpture. Using locally available materials such as clay, wood, rocks, scrap metal and wire, and cardboard, create a figure that represents a present-day ushabti. After choosing materials, make sketches for your figure, making sure that it reflects the idea of a sacred object meant to house a person’s spirit. Try to endow the sculpture with personal physical traits.